Enter your email address to follow VigilanteMMA and receive notifications of new posts by email. So you wanna be a fighter? Here’s a little morsel of goodness that makes me wish there was a Seniors Division in MMA. 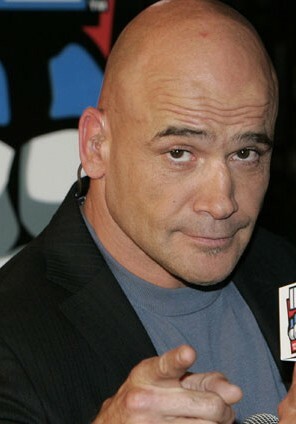 Former UFC champion/legend/TV personality/actor Bas Rutten says he wishes he had a chance to fight Rickson Gracie back in the day. That would have been a classic. Fighters Only posed the question to Rutten, “Is there one fighter you never faced off against, but wished you had?” Rutten didn’t hesitate to mention the legendary Gracie. Rutten is one of the most successful fighters in the history of the sport. He also has the distinction that not many legends can claim—he never went on a decline at the end of his career. Top the contrary, Rutten’s last fight in the UFC was when he defeated Kevin Randleman for the UFC heavyweight title. At that time he was 27-4-1 with an incredible string of 21 straight fights without a loss. Injuries in training forced Rutten to the sidelines in 1999. At about the same time Rutten was racking up wins, Rickson Gracie was taking a slower approach to building his own legend. Finishing his MMA career at “only” 11-0, he was considered by many to be the best in the world, thanks in part to the aura that followed him. Rickson’s fans ate up the story that he had in fact been in over 400 fights in his career—winning all of them. His own father, Helio Gracie disputed those claims, saying that Rickson was counting practice and sparring sessions to get to such a large number. That’s when Helio hilariously said that using that math, he (Helio) could have well over a million victories in his career. But there’s no question a Rutten/Rickson fight would have gone down as a big one during that era. But unless we see the UFC start a Legends Division, Rutten (49) and Rickson (55) slipped away from us.